I had a chance last month to speak to the convention of the Constitutional Sheriffs and Peace Officers Association. 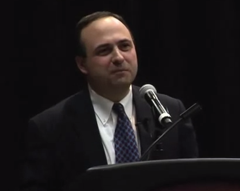 I talked about nullification, the book and the concept. (I note that Amazon has only six copies left at $10; after that it’s back to the $16.47 ones.) Not much new here for longtime readers; I gave my basic overview because I assumed the audience was relatively new to the subject. The main significance is that over 100 sheriffs and peace officers were in the room. Naturally, YouTube chooses a still shot of me with my hands up….